Be the first to share your favorite memory, photo or story of Alvis. This memorial page is dedicated for family, friends and future generations to celebrate the life of their loved one. A Taylorsville resident, Mr. Alvis Owen Shirley, age 90, passed away Monday, October 22, 2018 at his residence. He was born March 30, 1928 in Spencer County to the late Harvey and Ada Lee Lewis Shirley. 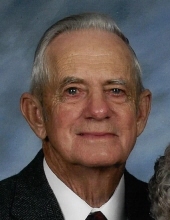 Alvis was a retired employee of General Electric, a member of Plum Creek Baptist Church where he was a Deacon and Sunday school teacher, a former board member of the Spencer Co. Soil Conservation District, and recently celebrated 70 years of marriage. Along with his parents, he was preceded in death by his brother, Bobby Shirley. He is survived by his wife, Verniece Riley Shirley, his son, Tony Wayne (Debi) Shirley of Taylorsville, 3 grandchildren, Kate (David) Akers, Emily Shirley, Mason Shirley, and 2 great grandchildren, Elle Christine Akers and Helena Shirley Akers. Funeral services for Mr. Alvis Owen Shirley will be 11:00 am Friday, October 26, 2018 at the Greenwell-Houghlin Funeral Home. Bro. Jon Rohr will officiate. Interment will be in Valley Cemetery. Visitation will be Thursday from 3:00-6:00 pm. The family requests that expressions of sympathy take the form of contribution to the Plum Creek Baptist Church Building Fund. The Greenwell-Houghlin Funeral Home of Taylorsville is in charge of arrangements. To send flowers or a remembrance gift to the family of Alvis Owen Shirley, please visit our Tribute Store. "Email Address" would like to share the life celebration of Alvis Owen Shirley. Click on the "link" to go to share a favorite memory or leave a condolence message for the family.